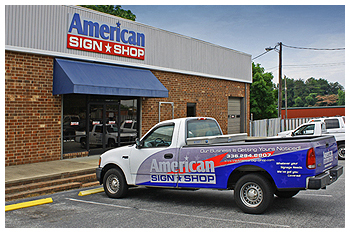 Serving the signage, vehicle graphics, and display needs of the Piedmont Triad for over 20 years. 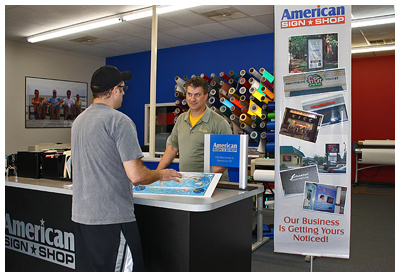 The American Sign Shop was established in 1989, and was purchased by Mike Linville in 1997. At that time there were only two employees at their location on Spring Garden Street in Greensboro, North Carolina. American Sign grew and evolved to keep pace with rapid changes in industry technologies, and soon moved to a much larger facility on the corner of Market Street and Edwardia Drive in Greensboro. The two original employees have since grown to ten, and their customer base has moved from 100% local to regional and national. Originally, the bulk of American Sign's business was cutting vinyl letters and logos, and while they still produce cut vinyl, much of their work now is output via digital four color printing. Adoption of cutting-edge ink jet printing has greatly expanded capabilities, lowered production costs, and reduced output time significantly. Additionally, large flat-bed printers can print to almost any substrate imaginable with photo-quality results. project is developed from start to finish. 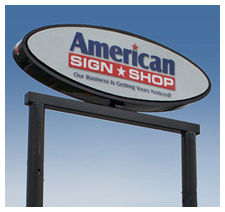 Looking forward, The American Sign Shop is committed to continually improving their process and embracing emerging technologies that will enable their clients to find innovative ways to be seen. After all... Our Business Is Getting Your Business Noticed!